Each session is designed to focus on reading, writing, and character education. Angie performs a reading of the book, Dori’s Gift, and then shares a PowerPoint that engages students in learning about the pioneer days. She also shares information on creative writing and inspires students as she shares about the publishing process. One of the most important aspects of the visit is the character building that the story initiates. 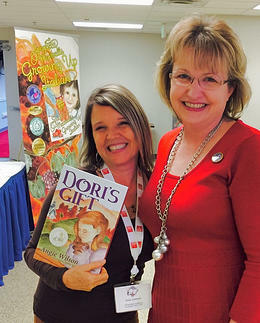 As Dori used her gifts for good things, Angie talks with students about their unique gifts that makes them special. Each student is encouraged to use their gifts to do good things as they sing songs that inspire.